GoPro announced on September 14, 2018 that it was closing the doors of Kolor, so no more Autopano or Panotour!!!!!! We're going to have to fight about PTGui or whatever. I discovered Autopano at the end of 2005 and was immediately impressed. It's remarkable how its designers keep listening to the complaints of users and thus how the software sanely evolves. One thing is sure, it's my favorite panorama software, before its main competitor PTGui, imagine! I thus want to congratulate and thank here Alexandre Jenny and Lionel Laissus, the designers, as well as the whole team at Kolor. New color correction engine - My favorite new feature! 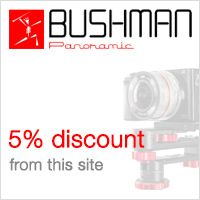 - the program is now able to correct, almost perfectly most of the time, a big recurring problem in panoramas, especially in landscapes ones or in panoramas shot at dusk: vignetting and even more vicious, gradients differences. Stitching of an even better quality for aerial photography - Autopano Giga only - The stitching of aerial views hence which haven't been shot from the same point of view is even better. 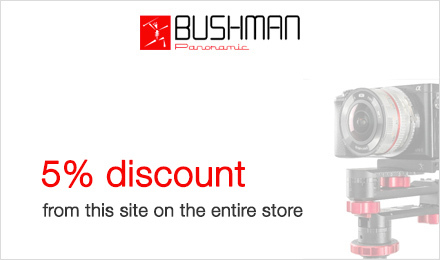 It will of course also improve the quality of shots taken free-hand. Suppression of artefacts at zenith and nadir (360° photography) - Especially at the zenith, a clear spot could remain because of a bad stitching, often due to a lack of raw material. Problem solved! 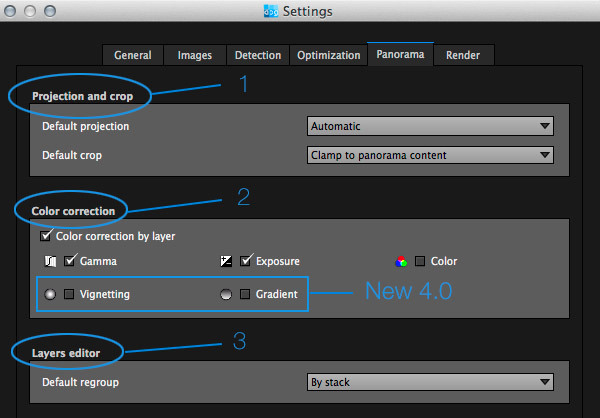 Since version 2.5, the default interface of Autopano is dark grey but it's possible to choose a lighter theme. 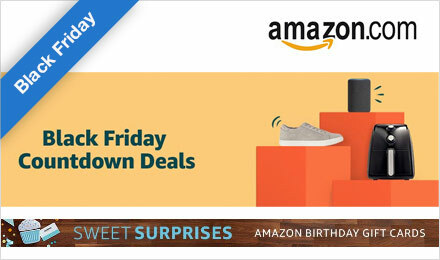 It comes within the scope of standards for professional photo editing software since it comes with a dark grey background. The icons have also been redesigned with brighter colors. The interface looks like the image below, meaning, a menu bar, classic at the top, an icon bar below - shortcuts - and a wide work area split in two parts: a left part for the content of the files and a right part for pre-stitched panoramas, ready to be finally rendered or edited. Temporary directory (1): Temporary files can be placed in one or several partitions, possibly dedicated, which is better with large-size stitchings. Indeed, Autopano Giga and image stitching are very demanding in terms of resources and it's preferable to place temporary files in separate partitions, themselves on hard drives that are not the installation one. The faster the hard drives (possibly in RAID 0-mounted SSD) the faster the software. It is thus a rule that works with other pieces of software like Photoshop. Piece of advice! If you have few RAM and you're experiencing stitching problems, place the cursor on the minimum. Use of GPU (6) : If your GPU allows it - you only have to launch the test - you'll be able to activate its use to make certain calculations a lot faster, I especially think about the pre-stitching of images - spectacular! - or even the visualization of the pre-stitched photo at 100 % and not completely pixelated as in the previous versions, when editing. Essential! 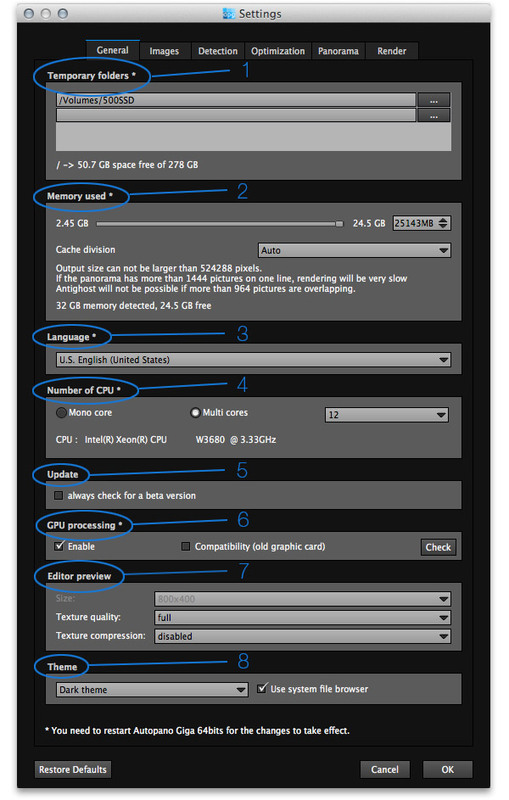 Since 2.6: the GPU calculation becomes accessible to old GPUs. 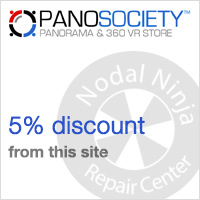 I just note here that Autopano Giga 4.2 or Autopano Pro 4.0 use the best stitching algorithms on the market, especially with very distorted lenses or very short focals with strong distortions. Even if we can set the sensitivity and the detection algorithms by default here, they can be changed at any time then. It is thus not very important. 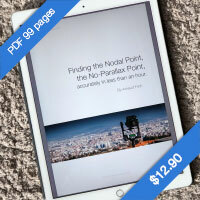 Links (2) : Choose free except if you always stitch images shot with a motorized panoramic head. Then you need to pick line. During the stitching of the project, the software will ask in what direction the photos have been taken to "naturally" place them in the right places. Width of the panorama (1) : Favorite projection - leave it in "Automatic" except if you always make rectilinear panoramas. Preferred width - If you leave it on "Reduced to the width of the content", the pre-stitched photo will also be displayed in the panorama editor in its whole width as shows the screenshot below on the left. If you choose "Maximum projection zone", you actually see the proportions of your panorama displayed in a work area of 360° x 180°. Your pre-stitching can really look small in some cases. 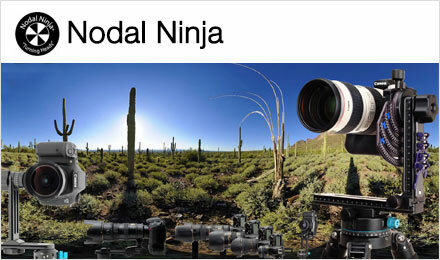 Of course, if you're shooting a complete sphere, the option chosen doesn't matter much! 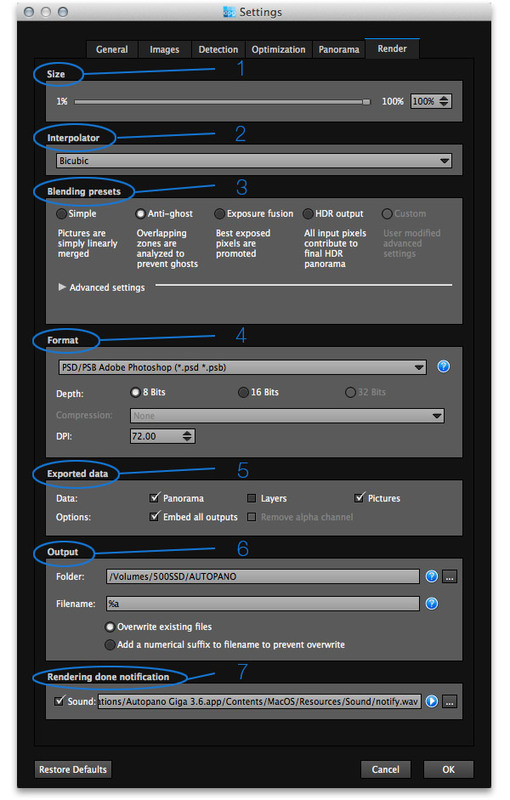 Exported data (5): Data: "Panorama" is of course to be left by default! 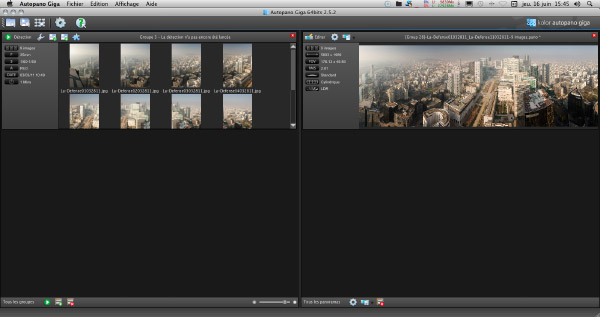 The "layers" option is only accessible in particular stitching cases with HDR bracketing, for instance. 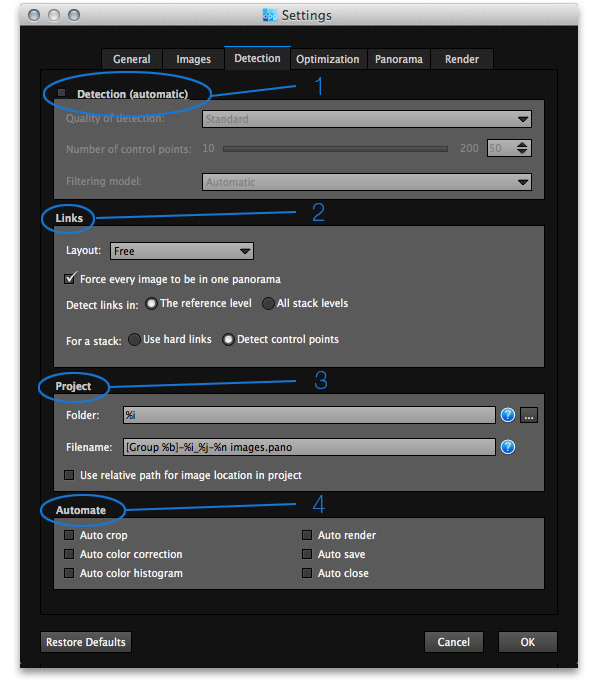 The "Images" option must absolutely be checked if you want to make multilayers in the Photoshop sense of the word in order to make corrections on the layer masks in this software. 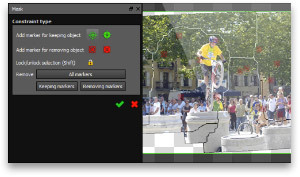 Indeed, thanks to this option, the panorama is rendered with the final panorama, as it would be rendered in flattened JPEG and the individual photos of the panorama are superimposed in Photoshop layers. It's essential to make particular edits very quickly. Options: "Incorporate everything" allows to incorporate all the photos on separate layers + the final panorama in the same file, for instance a PSD (Photoshop format). Output (6) : You can choose, as I did, the folder and even better, the partition, if possible on a fast hard drive and different of the one of installation of the software, the finally stitched panoramas. For the 2010'record - Paris26gigapixels - : even if I needed 2'30 to make the final rendering of a quite heavy stitching when choosing as output drive a classic hard drive at 7200 tours, yet different from the installation one, I only needed 1'30 hence one minute less!!! when the final photo was saved on the very fast partition made of four SSD hard drives mounted in RAID 0 on a PCI card (writing speed 700 Mo/s against 80 Mo/s) .